Too little, too late. Nigel Pearson showed naivety and a lack of ambition with his single, late substitution. It was a disappointing performance from him as well as from his team which appeared aged and flagged, a shadow of other performances we have seen so far this season. There was a lack of hunger, passion and enthusiasm. A change is needed. At this point last term Sven Goran Eriksson revitalised Leicester's fortunes with the signing, on loan, of Yakubu. Oh, what could have been! 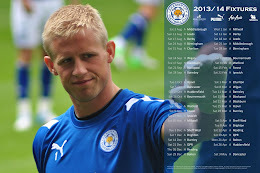 But this season again, the Foxes need an unlikely talisman to step up to the plate. If Jermaine Beckford cannot be that man then maybe Billy Sharp or another Premier League loanee can. Whatever, whoever it is, something has to change - now. One of few players offering a show of effort, Lloyd Dyer's classy bringing-down of Matt Mills' long ball was the highlight of this afternoon for Leicester fans. His finish was far from perfect but his positioning and control were sublime and the ball ended-up nestling sweetly in the back of Luke Steele's net. He may be out of favour according to some supporters, but should Dyer leave Leicester he will leave with his head proudly held high. Another solid performance from Leicester City's stand-out player of this season. It could - would - have been four but for two outstanding saves from the Foxes' number one. Another solid performer on a day where they were sadly absent in the Foxes' line-up. This was the first time this season that Lee Peltier has looked out of his depth in the Championship. He lacked the awareness and pace needed to contend with the dangerous Ricardo Vaz Te who he offered time and space with. The second of Barnsley's goals was a near-carbon copy of the first and on both occasions it was down to Vaz Te, given room to manoeuvre by Peltier, that led to Gray hitting the net. The manager can, for once, take the whole blame for a dire performance and his team's defeat. The single substitution came far too late - the Foxes had been behind for nearly forty minutes before Jermaine Beckford came on for Paul Gallagher - to have any impact and so it proved. Pearson has an up hill struggle to revive Leicester's season and, now, he must do so without the backing of a fair number of his previously loyal fans. The Leicester fans lost out on two counts today. The first was that their team's performance was a poor one but it is the second count that is far more damning. The chorus of jeers at full time was a pathetic and disgraceful show of in-empathy to a team that lacks confidence and conviction. Yes, those wearing the royal blue of Leicester City may be overpaid prima donnas but so things have become in football across the globe today. This Leicester team is a frail one needing the support of the club's fans and not the sort of ridicule and rude booing that was heard across the terraces this afternoon.